Ahmedabad- based Airmed Pathology Labs Pvt Ltd, which runs diagnostic home services startup Airmed, has raised Rs 10 crore ($1.47 million) in pre-series A funding from Brand Capital, the ad-for-equity investment arm of media firm Bennett, Coleman and Company Ltd's (BCCL), Amit Gupta, co-founder of Airmed told TechCircle. The startup will use the funds for brand marketing to acquire users, Gupta said. The firm offers services such as blood tests, free employee check-ups, annual body check-ups and health test subscriptions. It uses a cloud-based technology to collect samples and run tests across its calibrated and controlled network of labs and pathologists. It also launched an app two months ago, which enables patients to book and manage their test results. The startup also uses Internet of Things (IoT) and bar code technologies to ensure that test samples are protected from heat, sunlight and contamination during transportation. "The diagnostic industry is growing at 16% CAGR and Airmed has a scalable asset light model. Given the industry dynamics, they can scale operations very quickly and have the capability to launch pan-India operations in the next 15 months," a Brand Capital spokesperson said in a statement. Airmed said it clocks around 1,000 orders per month and claims to make a profit on every order. In Ahmedabad, the company has over a dozen labs. The firm is gearing up to launch itself in Delhi, Gurgaon and the rest of Gujarat by next month. By March next year, it aims to add over 100 labs. Airmed was founded in February 2016 by Gupta, an alumnus of Indian School of Business, Hyderabad; Aradhana Gupta, Gupta's wife and a pathologist; and Piyush Gupta, an engineering graduate who leads operations for the firm. Although Brand Capital invests in lieu of ad space across BCCL's media publications, including The Times of India and The Economic Times, it also invests a small amount as cash in some portfolio firms. Its investments are largely in consumer-facing ventures and it uses ad as a currency to pick stakes. Its most recent investment was in e-commerce firm Infibeam, where it invested Rs 60 crore ($8.8 million). 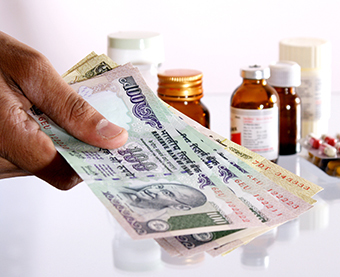 Earlier this month, it invested an undisclosed amount in Genmedic Healthcare Pvt Ltd, which makes vegetarian nutritional supplements under the Super Gummy brand.